I’ve added the Core i3 530 to our Bench database, if you want a full comparison of results head over there. What I’m providing here is a subset of our tests to show the 530’s strengths and weaknesses. 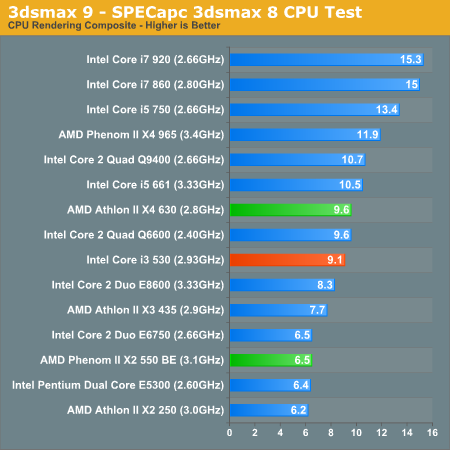 In every single non-gaming test, the Core i3 530 bests the Phenom II X2 550 BE. 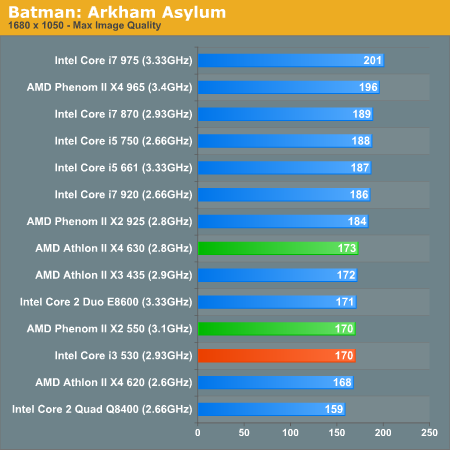 In our gaming benchmarks the 550 was faster in two out of our 8 benchmarks. In the rest, the i3 took the lead. 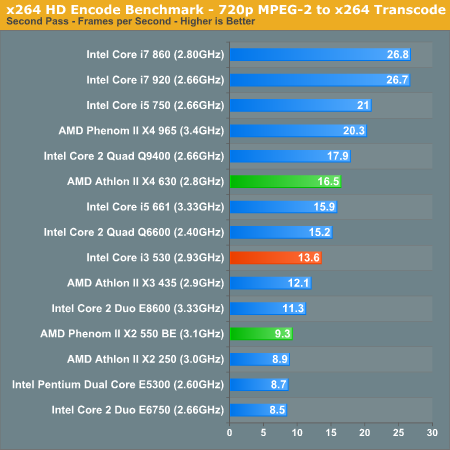 The Core i3 530 also manages to outperform the Phenom II X2 550 BE while using significantly less power. In the battle of the dual-cores, the i3 wins. AMD needs to fight with clock speed at at 3.1GHz, the 550 can’t muster enough to beat the i3. 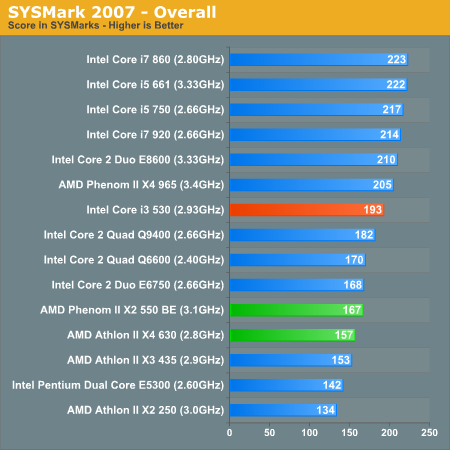 The Athlon II X4 630 comparison is a little more complicated. In single and lightly threaded applications, the i3 is a much better performer thanks to its higher clock speed. 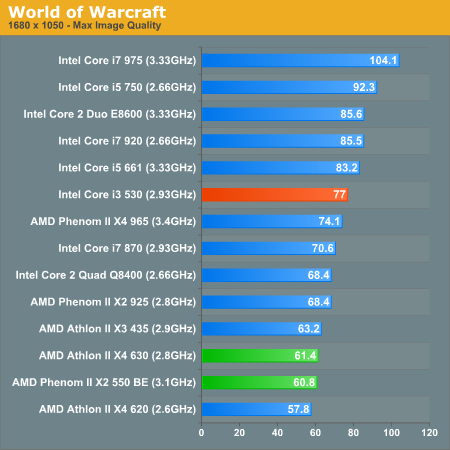 The i3's gaming performance is also significantly better across the board. 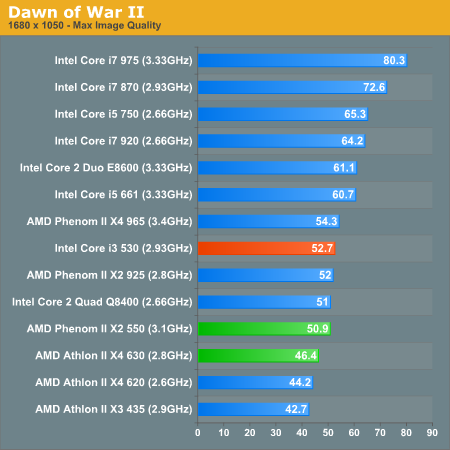 What the Athlon II X4 loses in clock speed, it makes up for in core count. Things like video encoding and offline 3D rendering are almost always faster on the Athlon II X4 630. Applications that are bound more by the performance of one or two threads are almost always faster on the Core i3 530. As a general purpose desktop microprocessor or a chip for a gaming rig, I’d opt for the Core i3 530. If you’re doing a lot of heavily threaded content creation, then the Athlon II X4 is the chip for you. If you’re somewhere in between, the choice is up to you. 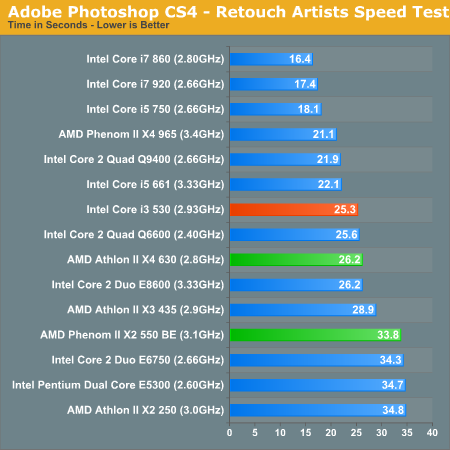 Our Photoshop test has the two processors very close to one another, but with the i3 taking the slight lead. Power efficiency obviously goes to the Core i3 530 thanks to its 32nm transistors. Correct me if I'm wrong but I thought it was well understood that Intel uses processor power to accelerate gpu functions. In other words the GPU is not nearly as fast as is appears the drivers offload work to the cpu since it is very powerful. I will try to post links to support this but don't remember them off hand as I thought this was common knowledge on "in depth" sites such as this. I believe that this was going on in part on G45 at least with benchmark software. Also that the driver looks for benchmark exe's and game exe's and manipulates quality and offloads to CPU. It doesn't change much for the end user as its still faster but bottom line I don't think the GPU is as good as it appears. Net performance however is as good as it has shown and this is brilliant of Intel to do. So the integrated GPU can be overclocked really high. Nice, but we're not gaming on this thing anyway. On the fourth page it says that overclocking without increasing the voltage will not increase power consumption. This is not true; while power is directly proportional to frequency, exponentially to voltage. 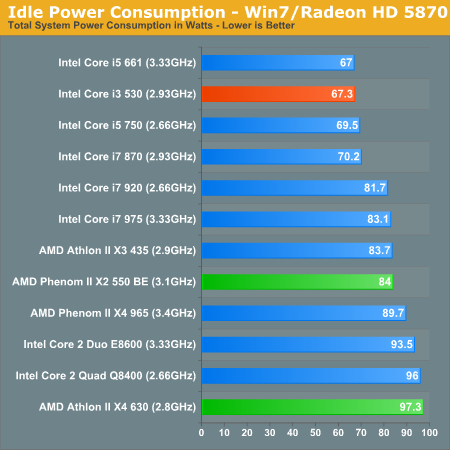 Could you post some idle and load power figures when overclocked at 4 and even 3.3GHz? I'm always hesitant to raise the CPU voltage. Thanks. As power consumption and efficiency has become more important, and manufacturing processes improved, how far you can push a CPU without increasing its core voltage appears to be the most efficient way to overclock. You minimize any increases in power consumption while maximizing performance. It does not say the power consumption will not increase, but that you will somewhat minimize the increase by keepingthe voltage at stock. You're right, but one also needs to keep the absolute value of the stock voltage in mind. A fine example are the initial 45 nm Phenom II chips: reviewers applauded them for being able to OC rather high at stock voltage. However, "stock" in this case meant 1.35 - 1.40 V. That's more or equal to the maximum Intel gave it's 65 nm chips. So either one could argue "great stock voltage OC" or one could say "wasting power by setting a unnecessarily high stock voltage". i am looking for the power consumption of the an amd athlon x4 620/605e with the 785G chipset. i can not find a review using just onboard graphics. 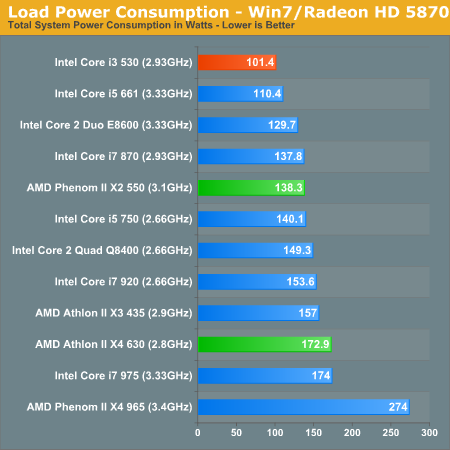 the anandtech benchmark database is nice, but it only lists power consumption with either the 5870 or geforce 280gtx. i myself have run into problems ( artifacts ) under windows 7 with both media center and MPC-HC in 64bit with DXVA too.